I have a soft spot in my heart for bunnies. The thought of someone eating rabbit is enough to either send me to sobs of grief or a murderous rage. However it is hard not to be entirely enchanted and wickedly giggle at The Bunny Suicides. The books do exactly what is said on the tin. It is a collection of bunnies committing suicide. Now I am aware that if you are not aware of this phenomenon then you will be simply revolted by the mere thought of cotton tailed critters bringing about their own grizzly end. However I believe dwelling on the subverted message of this comic is not good for the soul. Instead you should just flick through the pages of these cute books and enjoy the oftentimes quite technical, quite cute and always funny ways in which these bunnies off themselves. 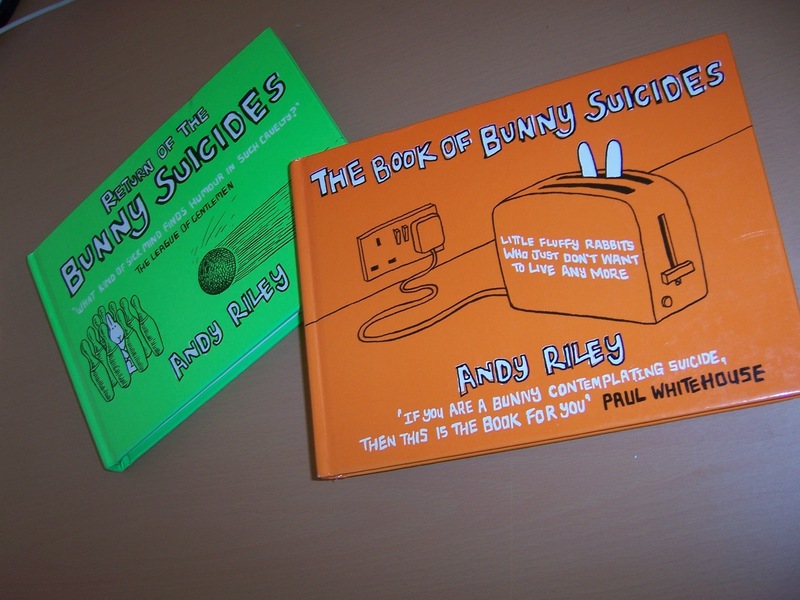 This entry was posted in Books and tagged Andy Riley, Book, Bunny Suicides, Comic by Jonathan Day. Bookmark the permalink.